The word “Paladin” usually refers to a holy knight or warrior, crusading in the name of good and order, and is a divine spell caster. Paladin characters are expected to demonstrate and embody goodness. 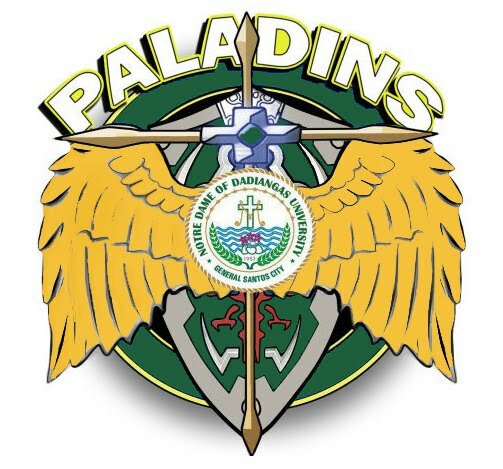 It is also the symbol chosen by the 2010 Graduating Batch of Notre Dame of Dadiangas University to represent their Alumni Batch Association. The Batch Logo consists of 5 symbolic figures namely the Shield, NDDU Logo, Cross, Golden Wings and the Green Circle. The Shield symbolizes the strength of all the Alumni fueled by the passion and guided Christian ways of Saint Marcellin Champagnant and God our Father. The shield served as our Moral Foundation in facing the real world outside the four corners of our Alma Mater. Engraved is the seal of our very own Alma matter, Notre Dame of Dadiangas University, which serves as a humble reminder of the Institution that molded us to become Marist individuals. The Cross symbolizes the fighting spirit and perseverance to strive for success and reminds the Alumni to never give up for what is good and right for one’s self and others. Moreover, it symbolizes the Faith of every Alumnus to God the Father, as the Ultimate Creator and Redeemer. It is therefore placed in the center of the Batch Logo to emphasize that every Marist Alumnus positions God as the center of their lives. The Golden Wings symbolizes the wings of victory itself which is used to soar higher not only for success alone but to also bring the Alumni closer to God. The wings are a perfect reminder of the fighting spirit one must posses in order to fulfill one’s dreams and ambitions in life. The Gold color of the wings symbolizes quality and truth. The Green Circle symbolizes the continuous and eternal practice of putting together calmness, strength, and steadfastness in oneself towards the road of success. The Green color symbolizes life and hope. We are reminded that life is a cycle and it must be lived with actions in a morally upright way. To God be the GLORY! Long live PALADINS!